Info "Put out the fire!" Shower Power is one of Dr. Crygor's microgames in WarioWare: Twisted! The name is a pun on the term "flower power". The game's purpose is to extinguish all the flames using the showers. 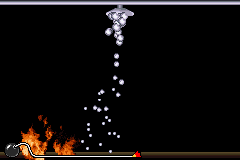 To do so, the player has to rotate the room to make the showers put out the fire. If done so, the game is won. 1st level difficulty: There will be only three showers and two flames, or one shower and two flames close to each other. 2nd level difficulty: There will be only one shower and two flames, or one shower on the wall and two flames close to each other. 3rd level difficulty: The stage will have only a curtain, one shower, and two flames. However, the curtain may catch fire when rotating the room. This page was last edited on September 26, 2018, at 23:30.